the Webring and New Dream Network. Well, you've made it this far! Once you have the code on your site email me ( parker@one.net ) with your Site ID number, and I should have you on the ring within 24 Hours. 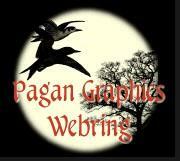 This Pagan Graphics WebRing site is owned by Your_Name_Here. Get the code here in this zip file! I was designing a graphic for my fiance's webpage... his nickname is Moon. It was the last night of the logo contest and I had failed miserably weeks earlier at coming up with a passable entry. In the middle of the graphic, I realized that it might work for the contest.... and it was about 2 hours til deadline. I was scrambling until the very last minute. Had the deadline been extended... I probably would have tweaked it until it was completely unusable! I use Paint Shop Pro 4, and two different graphics. One was an old cut of a pair of terns which I darkened until they made a good shadow, and the tree was a photo from a very old book on trees. Used a lot of cut & 'paste as transparent' techniques. The font is called Cheshire. If you just want to copy and paste from this page, the code is below! remember to replace "_SITE_ID_HERE_" with your ID Number! And put YOUR name and Email address in the code, where noted. Below are the graphics ( right click on each to save ).